BURGOYNE, John. State of the Expedition from Canada. 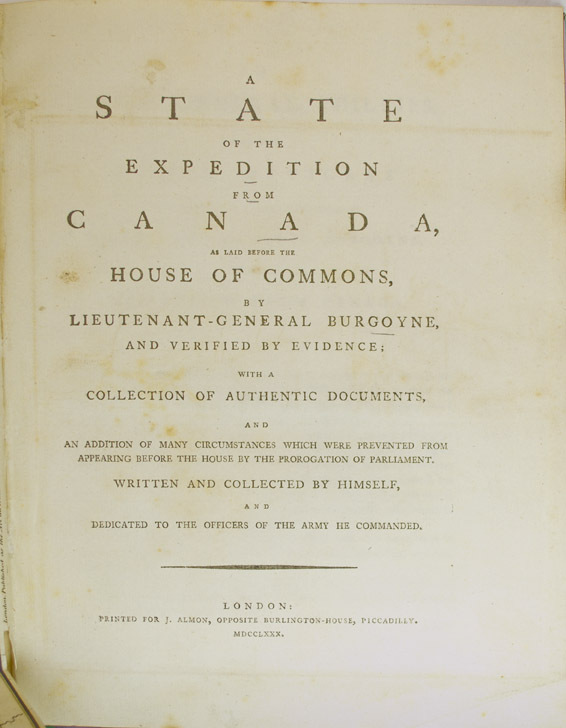 As Laid before the House of Commons, by Lieutenant-General Burgoyne, and Verified by Evidence; with a Collection of Authentic Documents, and an Addition of Many Circumstances Which Were Prevented from Appearing before the House by the Prorogation of Parliament. Written and Collected by Himself, and Dedicated to the Officers of the Army He Commanded. London: Printed for J. Almon , 1780. First edition. Quarto (10 3/4 x 8 1/2 inches; 273 x 215 mm). viii, 140, [lxii, Appendix], [1, publisher's ads], [1, blank] pp. With six folding maps, including frontispiece. All of the maps have some contemporary hand-coloring in outline. Two of the maps with overslips. 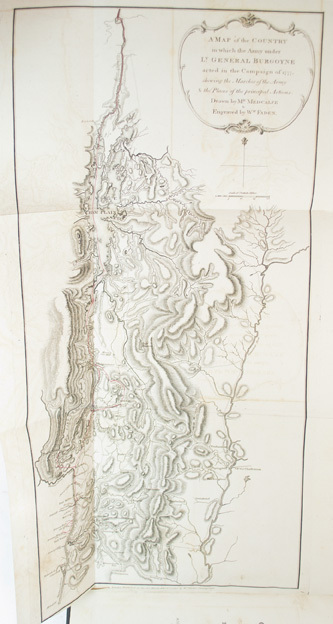 All maps are engraved by William Faden, and drawn by Medcalfe, Gerlach, Durnford and W.C. Wilkinson. Mid-nineteenth-century half black morocco over marbled boards. 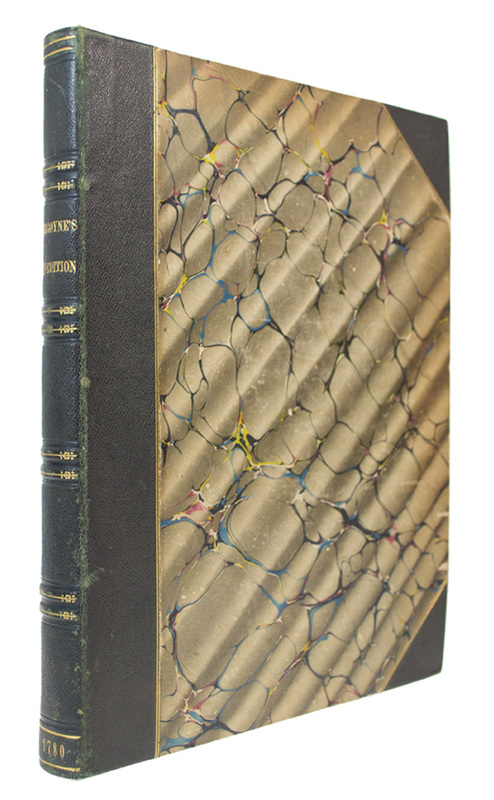 Spine stamped and lettered in gilt. All edges speckled brown. With green silk placeholder. Edges a bit rubbed. A bit of light offsetting to maps, but generally very clean. Previous owner F.A. Crownshield's armorial bookplate on front pastedown. Overall a very good copy. From the Kenneth Hill Collection. "Burgoyne defends his actions in the campaign that led to the disaster at Saratoga. He proves in this work that his army was half the size he had demanded, and was badly provided for. The work is one of the best sources on the campaign. " (Streeter).